IV.88 She went insane and lost her reason. IV.90 All her lower members trembled beneath her. IV.92 While the battle-gods were sharpening their weapons of war. IV.96 He let loose the Evil Wind, the rear guard, in her face. IV.98 She let the Evil Wind in so that she could not close her lips. IV.100 Her inwards were distended and she opened her mouth wide. IV.104 He threw down her corpse and stood on it. IV.128 And returned to Tiamat, whom he had bound. IV.130 And with his merciless club smashed her skull. IV.132 And let the North Wind bear up (her blood) to give the news. IV.134 They brought gifts and presents to him. IV.136 In order to divide the lump by a clever scheme. 儘管有些人仍然認為，這圖象描繪馬獨克和徹墨之間之戰鬥。但是，這兩塊石板是在尼姆魯德(Nimrud; 聖經中的迦拉 [Calab])戰神Ninurta寺廟hi9入口處被發現。圖象上亦刻有向Ninurta祈禱文。所以我們可以肯定，追殺怪物是神是Ninurta，不是馬獨克。 此外，左面怪物顯然是男性，也是地和空中之物，也就是說，牠不可能是女性和水神徹墨。Heidel, Alexander. 1951. 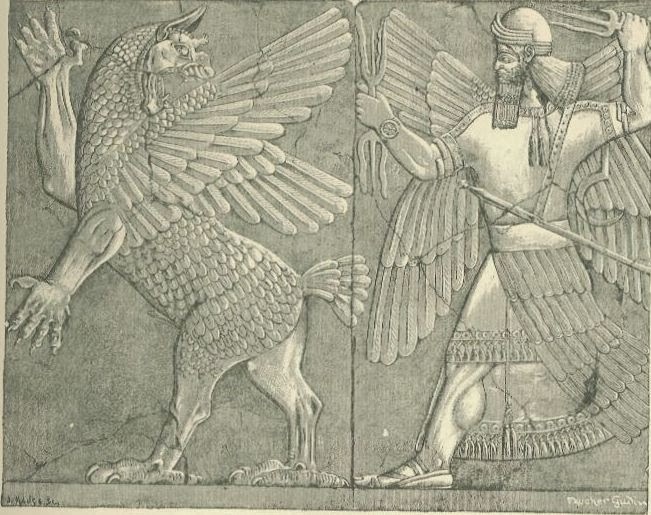 The Babylonian Genesis, 2nd edition. Chicago: University of Chicago, p. 86-87. Nahum M. Sarna, Genesis, The JPS Torah Commentary (Philadelphia: Jewish Publication Society, 1989), 2–3.